We began scrutinizing New Testament texts that "kingdom now" theologians employ in an attempt to argue that the kingdom is a present reality to show that none of these passages teach a present, spiritual form of the kingdom. We began examining the typical texts from Acts used by "kingdom now" theologians. Jesus Currently Reigning on David's Throne? Perhaps the primary reason advanced by "kingdom now" theologians in their attempt to equate God's present work in the church with a present, spiritual manifestation of the Messianic kingdom is that following His Ascension Christ supposedly took His seat on David's Throne in heaven. From this regal position He now orchestrates the spiritual, Messianic kingdom through the church. However, it is far better to reject the notion that the Davidic Kingdom is present in any sense today and instead to maintain that this kingdom will not be inaugurated until the millennial age. At least six reasons support this conclusion. First, we noted that the Old Testament consistently depicts the Davidic Throne in terrestrial rather than celestial terms. 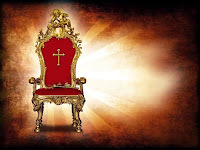 Second, we noted that because of this scriptural portrayal of the Davidic Throne, to argue that the Davidic Throne is now manifesting itself in this age from heaven is to place under unnatural duress the notions of progress of revelation and literal or normal, grammatical, historical hermeneutics. Third, as we began explaining in the last two issues, no New Testament verse or passage, including those frequently appealed to in early Acts, clearly puts Christ on David's Throne in the present age. Fourth, the prophet Daniel made it clear that the Davidic, Messianic kingdom could not come until the kingdoms of man had run their course (Dan. 2; 7). During the kingdoms of man, Daniel predicted that Israel would be trampled down by various Gentile powers. These powers include Babylon, Medo-Persia, Greece, Rome as well as the future revived Roman Empire of the Antichrist. Only after the final kingdom of man (the revived Roman Empire of the Antichrist) will have been deposed by Christ, would the Davidic kingdom then be established on earth (Dan. 2:34-35; 43-45; 7:23-27). Unfortunately, kingdom now theologians ignore this chronology by arguing for a present, spiritual form of the kingdom despite the fact that the kingdoms of man have not yet run their course, the Antichrist and His kingdom have not yet been overthrown, and the Second Advent has not yet occurred. Far from God's Kingdom being established in the present, it is actually the kingdom of the Antichrist that is seemingly on the rise. Amillennialists hold that this kingdom was established by Christ at His First Advent and that now the church is that kingdom. They argue that: (a) Christianity, like the growing mountain, began to grow and spread geographically and is still doing so; (b) Christ came in the days of the Roman Empire; (c) the Roman Empire fell into the hands of 10 kingdoms (10 toes); (d) Christ is the chief Cornerstone (Eph. 2:20). Premillenarians, however, hold that the kingdom to be established by Christ on earth is yet future. At least six points favor that view: (1) The stone will become a mountain suddenly, not gradually. Christianity did not suddenly fill "the whole earth" (Dan. 2:35) at Christ's First Advent. (2) Though Christ came in the days of the Roman Empire, He did not destroy it. (3) During Christ's time on earth the Roman Empire did not have 10 kings at once. Yet Nebuchadnezzar's statue suggests that when Christ comes to establish His kingdom, 10 rulers will be in existence and will be destroyed by Him. (4) Though Christ is now the chief Cornerstone to the church (Eph. 2:20) and "a stone that causes [unbelievers] to stumble" (1 Peter 2:8), He is not yet a smiting Stone as He will be when He comes again. (5) The Stone (Messiah) will crush and end all the kingdoms of the world. But the church has not and will not conquer the world's kingdoms. (6) The church is not a kingdom with a political realm, but the future Millennium will be. Thus Nebuchadnezzar's dream clearly teaches premillennialism, that Christ will return to earth to establish His rule on the earth, thereby subduing all nations. The church is not that kingdom. Fifth, because the church is an unrevealed mystery to the Old Testament writers (Eph 3:9), it is wholly unrelated to the Davidic Covenant and Kingdom. Ryrie presents a word study from both the biblical and extra-biblical material and thus concludes "...that the mystery of the equality of Jews and Gentiles in the one body of Christ was unknown and unrevealed in the Old Testament." Thus, unless overtly stated in the New Testament, the church cannot be connected to an Old Testament concept if the church was unrevealed at the time the concept was given. Sixth, because the church represents a parenthesis or an intercalation in God's dealing with national Israel and because the Davidic Covenant pertains to national Israel, the church is unrelated to the Davidic Covenant. Kingdom now theology rejects viewing the church as a parenthesis instead opting to understand it as part of a unifying kingdom theme found throughout Scripture. Yet a parenthesis is the best conceptual tool for understanding God's purposes for the Church Age. The first 69 weeks of Daniel's prophecy of the 70 Weeks (Dan. 9:24-27) represent God's past program for national Israel while the 70th week represents God's future program for national Israel. The Church Age transpires in the interlude between the 69th and 70th weeks. Thus, the church represents a unique spiritual organism where Jew and Gentile experience equal status (Eph. 2:11-22) in between God's past and future program for national Israel. This interlude is best captured through the conceptual tool of a parenthesis. In sum, because God's present work through the church can best be described as a parenthesis or interlude between God's past work with Israel (the first 69 weeks of Daniel's prophecy) and God's future work with Israel (the 70th week of Daniel's prophecy), and because the Davidic Covenant and kingdom specifically concerns Israel rather than the church, the Davidic Covenant and Kingdom could not be fulfilled now in any sense during the present Church Age. It is for these preceding six reasons that the Dispensational tradition has never confused Christ's present session with the Davidic kingdom. The only exception to this rule is the modern advent of Progressive Dispensationalism, which maintains that the Davidic Kingdom is present in spiritual form as Jesus now reigns from David's Throne from heaven over the church. While still holding to a future or "not yet" earthly reign of Christ following Christ's Second Advent, Progressive Dispensationalists still argue that the Davidic Kingdom is "already" here in spiritual form. However, as we will see in the next installment, because of this radical alteration in understanding Christ's present activity, many question whether this new theological approach legitimately deserves the title Dispensationalism. L.S. Chafer, Systematic Theology (Grand Rapids: Kregel, 1993), 5:273-79. J.F. Walvoord, The Millennial Kingdom (Findlay, OH: Dunham, 1959), 203. See also J.D. Pentecost, Thy Kingdom Come (Wheaton: Victor, 1990), 144-45. Although one discovers multiple references of Christ in His present session portrayed as the David heir (Heb. 1:6; Rev. 3:7, etc...), no verse portrays him seated on David's Throne ruling in the exact terrestrial manner predicted in 2 Samuel 7:12-16. J.D. Pentecost, "Daniel," in Bible Knowledge Commentary , ed. Walvoord and Zuck (Colorado Springs: Victor, 1985), 1336. Charles Ryrie, Dispensationalism (Chicago: Moody, 1995), 134. Randall Price, "Prophetic Postponement in Daniel 9 and Other Prophetic Texts," in Issues in Dispensationalism , ed. Master and Willis (Chicago: Moody, 1994), 141-50.